How can the RCI Show 2017 help you? The RCI Show showcases all that’s great in the roofing, cladding and insulation industries. For contractors, attending the show is a great opportunity to move your business forward by seeing and learning first-hand about new products and services coming on to the market. You’ll find a unique mix of expert speakers, lively debates and product demonstrations, as well as the chance to talk to exhibitors about what’s happening in the industry. The show is a unique opportunity to source and learn about new products that can save you time and money on site, with ten live demonstration zones getting you close to the action and access to the experts. Feedback from the 2016 event was overwhelmingly positive. 100% of those asked said it was a very worthwhile day that allowed them to learn about new products that can save them time and money on site, and that they would ‘definitely’ attend the show again in the future. One very popular initiative that will definitely return in 2017 is the CITB drop-in clinic. This is where you can receive advice on taking on apprentices and up-skilling your workforce – more relevant than ever with the skills shortages affecting construction. As the UK’s only dedicated roofing, cladding and insulation exhibition, this has become the annual national event for our industry. It is the perfect platform for you to keep up-to-date with what’s current, see how you can up-skill, and enhance your credibility with customers. It’s benefits such as these that, ultimately, will help you get more jobs and grow your business. At the show you can source thousands of products from over 130 exhibitors, learn pivotal information in the two bespoke seminar theatres, and meet and greet new and existing customers. And it all takes place over two days, all under one roof. Whatever you’re planning for 2017, be sure you get to the Ricoh Arena on 1st and 2nd of November as the RCI Show opens its doors once again. Three quarters of exhibition space is already sold, and organisers are promising an even more worthwhile and successful event in 2017! 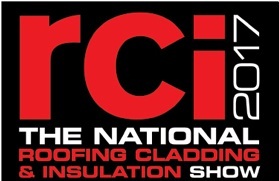 To book your FREE tickets, please visit www.rcishow.co.uk.